The first moments following a nuclear attack are crucial. If you’re right in line of the blast, well … you’re pretty much toast. For people out of the initial blast’s way, but still subjected to lethal fallout, making the right steps can mean the difference between life and death. Not satisfied with the official government recommendations in case of nuclear fallout, Michael Dillon, an atmospheric scientist at Lawrence Livermore National Laboratory in California, proposes a mathematical model that looks at a few important scenarios and tells you when and how you should leave your house in search for better shelter. Dilon started exploring the topic some 5 years ago after the U.S. government called out for more research into nuclear sheltering. After being asked by family members what they should do in case of a nuclear emergency, the scientist was struck by the fact he didn’t have a definite and satisfying answer. There’s clearly no ONE way to handle this sort of stuff. The dread alone in face of such an incident is enough to petrify most people. In some standard cases, and if the person in question manages to keep his reason, lives can be saved. The official government notice is seek shelter and stay put! In California, where Dilon is from, there aren’t really that many basements, though. So, he decided to make a mathematical model in which he looks at a couple of situations in which people need to move while nuclear fallout is still infesting the atmosphere. A nuclear event similar to the one that destroyed Hiroshima and Nagasaki was chosen for his calculations. Although nuclear power states today have thousands time more power in a single warhead, the assumption is that a nuclear attack would be more likely coming from a terrorist threat, which would typically use a low-yield warhead. there’s enough room for everybody in the shelter. Put otherwise, he ignores how the beast in men comes out in life and death situations. He’s conclusions are summed up in the image below. It all boils down to this, though: the ratio of the time you spend hunkering down in your first shelter to the time you spend moving to the high-quality shelter. Surprisingly enough, the best course of action would be not to stay in your initial, poor shelter but to run to your nearest safe shelter – preferably somewhere with very thick concrete armor. This goes against the official recommendation that says you should stay sheltered no matter what for the initial 12 hours following the nuclear blast. 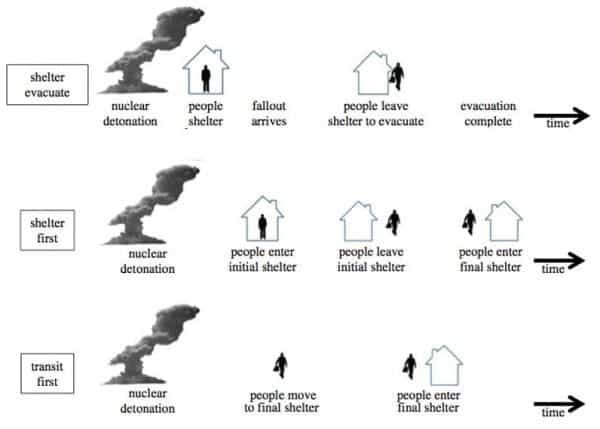 n. If you have poor shelter but higher quality shelter is available farther away, you should get to that high-quality shelter no later than 30 minutes after detonation. Nevertheless, the model serves as a good starting point for what’s useful and what’s useless to do in case of a nuclear attack, although it has yet to be cleared by a government body.